I'd heard people rave about Clubbercise (unintentional pun) so, as part of my latest attempt at being healthier, I decided to try out this new fitness class. A few people I know had tried it and said how much fun it was. Now before I go any further I think it's important to stress that I really ​don't like fitness classes! I have really tried to persevere with them, as I know there​ are many benefits and there are millions of people who really do love them. Group exercise has never kept my interest ­ I enjoy getting out in the fresh air; riding bikes, horses, swimming in the sea and lakes. Being a competitive person I quite like team sports too, but to be honest, I've been a bit lazy of late my exercise regime has mostly consisted of walking the dog! So I was up for giving this new Clubbercise concept a shot - despite the fact I’m really, really uncoordinated! Anything more complicated than a side step means I spend the duration of the class looking like a buffoon… and just as I think I've grasped it the move changes! I end up frustrated and feeling that I haven't really got much exercise. However, at the very least it was a good opportunity to meet up with my friend and do something different. Arriving about a minute before it started (ooops) I first noticed the hall was darkened and strobe lights were in play. Then we were given an impressive pair of glow sticks! I was expecting the ones you have to bend to activate, but these were posh LED ones with buttons to change the settings to different flashing modes - ­ imagine mini light sabers… except with wrist straps for health and safety reasons in case you got a bit overexcited! The instructor was lovely and very welcoming, making sure we were fit and healthy to take the class. I'm certainly not fit or healthy but I have no conditions other than Lazyitis​, which wasn’t listed on the health form! We picked a space in the center with a good view of the instructor who was on a stage at the front. It was great that it was dark as I didn’t feel self conscious even though it was a well attended class in a big hall ­there were a lot of nostalgic ravers out there! It was good to see people of all shapes and sizes and a wide mix of ages too. The routines were aerobic ­based and easy to pick up ­so good for someone like me. What I loved about it was that even when they did the high impact bits you could take the easy route with the low impact. 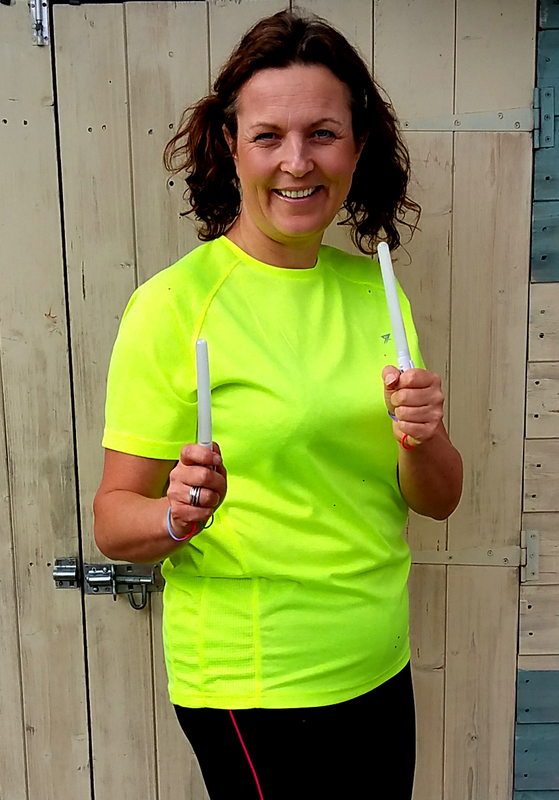 As well as an inspiring, neon-­clad instructor, the glow sticks, the disco lights and the dark is what made it different to your normal aerobics class. There was a great atmosphere ­ everyone seemed to be having fun… and that's coming from someone who doesn't really like aerobics and never really liked clubbing either! There were a few breaks to swig a bit of water (the more breaks the better for me) and before I knew it we were slowing into the cool down track. The time passed quickly but the sweat and reddened face was proof I’d burned lots of calories. Although they call it glowing rather than sweating! Overall it gets a big YES vote from me. I think it’s a fab idea and it seems to be attracting a lot of people who wouldn't normally be up for fitness classes due to the emphasis being on having fun. On further research I also LOVE the fact that Clubbercise support important causes. They donate money made from training instructors to Oxfam to provide safe drinking water to poor places on the planet. They are also backing Sport England’s #ThisGirlCan​ campaign to encourage women to exercise without fear​ of judgement. I will definitely be heading back Clubbercise again as a date with friends ­ plus I’m keen to be reacquainted with my glow sticks!